HONG KONG—Premier league leaders SSSC-A maintained momentum in the title race with a 2-0 win over Valley-A, who only last weekend held defending champions Khalsa-A to a surprise 1-1 draw and were expecting to repeat or surpass their efforts this past Sunday at the Wiley Road venue. However, it was the much more anticipated latter clash between Khalsa-A and KNS-A to hold center stage as both sides see-sawed their way in front of 80 percent screaming fans edging their favorite team onwards. And no one was left disappointed as many of the fans were left hanging as the game entered the break on a 2-1 Khalsa lead with the defending champions eventually leaving the venue on a 4-2 winning note. Khalsa-A coach Malkit Singh handing plaudits not only to his team’s efforts but also to his rival keeper Arwinder Singh, who was given a standing applause by his club’s supporters’ for the many brilliant blocks Arwinder made during the game that would have seen an avalanche of goals come their way had it been any other goal-tender. “I think the Khalsa supporters showed true sportsmanship by applauding their former keeper (Arwinder Singh) who had a brilliant game against his former club,” said Pannu. Arwinder, who previous played for his university and club side in England is also looking to change the way KNS plays not only this year but to the many years to come. Pannu further praised his side as they had truly made it a ‘team effort’ to breakdown their rivals. Arwinder Singh, was definitely the ‘Man of the Match’ as he time and again broke down the Khalsa attacks with some brilliant goalkeeping as he repeatedly made some astonishing saves, which included at least four point-blank range shots and running out to deny another Khalsa raid but it was still not enough to save his side. Arwinder who is also captain for his side also complimented his team for their ‘never-say-die’ attitude right up to the final whistle. “Overall we have had a pretty good team over the season as we have had a couple of guys coming in through the season from overseas and in this game we had a pretty strong team,” the stocky goal-tender said. “The confidence level was pretty high and we maintained a good and high level of hockey in the first half and it was only in the last 15 minutes our defence went to sleep but then again we are gradually improving from game to game,” he said. SSS-A are still top of the standings with their 2-0 win over Valley-A while Khalsa-A are in second place but will be severely tested when they take on HKFC-A next Sunday,. 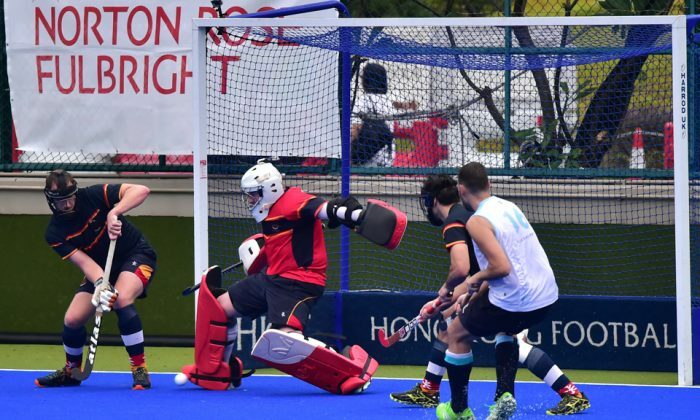 HKFC-A remain in third place after they ended Sunday 3-0 winners over HKCC-A. In other results, KCC-A were edged by HKFC-B 3-2 while Shaheen-A crashed out to Pakistan-A 4-0.